You may still be able to book by calling the hotel at 201-864-7300. New Jersey might have its fair share of tacky celebrities (if you can really call the Jersey Shore kids "celebrities"), but it also has its share of bonafide rock legends -- like Bruce Springsteen and Jon Bon Jovi, who are among the many who have performed at the nearby Meadowlands Complex. In the midst of it all is the Embassy Suites Hotel Secaucus - Meadowlands, offering spacious accommodations to visiting groupies, those venturing into NYC for business or pleasure and passing travelers on the New Jersey Turnpike. Whatever your reason for a stay here, you'll want to take advantage of the complimentary cooked-to-order breakfast and evening manager's reception with hosted drinks. Now those are both worthy of at least an air fist pump! 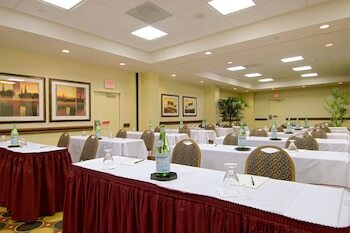 Embassy Suites Secaucus - Meadowlands is a 3.5-star hotel located at 455 Plaza Drive, Secaucus, NJ 07094, US . Its nightly price usually falls between $114.3 per night and $457 per night, excluding tax, depending on room category. $114 per night found for a Studio, 1 Queen Bed, Non Smoking room type. Embassy Suites Secaucus - Meadowlands sells rooms through sites like Room 77, Expedia, Hotels.com, GetARoom, and many others. Room 77 searches across dozens of different sites to find the lowest discount rates available. The lowest rate we've seen over the last few weeks was found on Room 77. In 1% of the cases we surveyed, all sites offered the same rate. You can compare real-time rates from all of these sites on Room 77. Room 77 is the only hotel shopping site that includes special discounts like AAA, senior, government, military, and corporate rates.